Lets Grow Together is an organisation that primarily establish environmental projects within schools, aiming to teach children about the value of food-growing. The projects they create introduce children to the environmental, health, social and financial benefits of food-growing through hands-on activities that teach practical gardening skills. LGT support schools with extended actvities such as garden construction and maintenance outside of the school day too. LGT also work with the wider community, including vulnerable groups, social housing schemes, care homes and more. Click here for more information on Lets Grow Together. We hold free classes at The Warehouse. Gnosis has always been in existence and will continue to exist, because it’s a universal knowledge of life. Gnosis does this by focusing us on the Innermost Self-realisation of the Being, where we can learn to develop our human potential to the maximum. Gnosis does not require followers. Instead Gnosis provides the means for people to find themselves – practically – by application – by working upon themselves. Gnosis deals with facts and not beliefs. It is about changing ourselves and not others. Best place to start is inside. We need to search for ourselves and directly experience. We must swim against the current, battle against ourselves. Everything is within us. By studying how we think, feel and act and to start to see that these aspects have common origins will start to generate a positive change within ourselves and we will start to view life in a better way. Being in, and working with nature, is a critical part of life. It is necessary that we respect and work with nature to ensure that the planet, its eco systems and ecology can flourish. This means that a radical change is needed both in society and the systems and also in the way we think, feel and act. Independent social work consultancy. Acting on behalf of service users, claimants and social workers, Celtic Knot also provide training. They are a virtual business priding themselves on their ethical and sustainable practice. Their services aim to manifest respect for human rights and justice, as well as minimising their ecological footprint, and maintaining high professional standards. Click here for more information on Celtic Knot. The Muslim Women’s Network is an Islamic feminist movement whose mission is to support and empower diverse Muslim women by ensuring that their voices and concerns are heard by decision makers. Their research into the experiences of Muslim women and girls informs their advocacy and campaigning methods with the aim to talk about difficult issues that are continually ignored. The Muslim Women’s Network became a registered charity on the 13th of December 2013 and are the only national Muslim women’s organisation in Britain. Brum Radio is Birmingham’s independent radio station, broadcasting 24/7 online with a fresh mix of music, arts and conversation. We have an established presenter line-up of Brum’s best DJs, comedians, raconteurs, promoters and musicians. Being independent gives us the freedom to schedule unique radio programming that’s all made in the Warehouse. Click here for more information on Brum Radio. Localise West Midlands is a non-profit oraganisation promoting a localised approach to supply chains, money flow, ownership and decision-making for a more just and sustainable economy. We have multiple functions which include acting as a thinktank; consultancy and campaign group, researching, advising and raising awareness of sustainable local economies. Click here for more information on Localise West Midlands. Friends of the Earth is the UK’s most influential environmental campaigning organisation. We are a unique network of campaigning local groups, working in more than 200 communities throughout England, Wales and Northern Ireland. Click here for more information on Friends of the Earth WM. 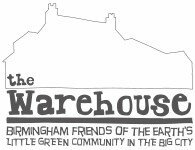 One of the ways that Birmingham Friends of the Earth creates positive environmental change is by providing cost effective space to organisations that share its mission. If you are interested in renting office space from us then please contact meet@birminghamfoe.org.uk for more information. Below you will find a list of people that have already joined us. Contact us for more information about available space. The Warehouse is a unique and quirky place, filled with some of the kindest, most enthusiastic and dedicated people in Birmingham. The synergy that you get from working with these people is motivational and the knowledge that is passed between tenants is invaluable. Whilst working here, we can offer you telephones, conference phones, reception services, IT support, broadband, photocopying, printing, laminating and postal services. We even have a cafe and wholefood shop in our building to keep you sustained during your work, and a bike repair shop to help you get back afterwards. Please browse through our list of office tenants and meeting rooms below to find out more.